I went on the Saturday. Did anyone else go? I think to call this a comic convention is a bit of a stretch - I think the comic alley covered about a quarter of the available space at most, the rest is for toys, movies and games. The comic panelist enclosure, ironically, was the only one without a schedule outside so it was hard know what was on which was a shame or I would have watched all of Dylan Teague's demonstration not just the end 15 mins when I was looking for somewhere desperate to sit down for a bit. No real presence by any of the large comic publishers although Marvel had a non comic stand in the movie section. Wandered around artist alley, Jim Cheung asked me to take a picture of him and his parents while I was leafing through his originals at his table. At the time I was just curious to see if some one would commission a full body blank cover sketch at £1000! Cool bloke though - had a chat to him and he was nice enough listen to my story about the 2000AD art comp at Thought Bubble and take a look at the two pages I had access to. I must remember to take my portfolios along to these things as Zenescope were accepting submissions. Finally, as part of my sitting down strategy attended a panel with an art agent from Ireland, a lady from Zenescope and someone else important who never turned up about the state of comics today. The discussion centered around comicsgates and not mentioning names in order to avoid giving them any more publicity (I have no idea I don't use Twitter), the fact that most comic readers seem to be in their forties , are we in a comic bubble that will pop at any second and do we just enjoy the ride until it pops? and price. Let's be honest ... I think it's all about paying £3.50 for an issue of Batman and is this sustainable and does it encourage new readership. Briefly, it's lots of American men angry about the fact that many of the best comics these days are created by women or feature characters with a different skin colour from them. Your life is richer for not knowing about it. I didn't realise the scale of MCM - it's the whole of ExCel. It's huge. I've never paid for autographs before, only for sketches, and felt odd parting with cash even for Chris Claremont. I'm really only used to Lawless, NICE & Leam Con - tiny cons where you almost have to pace yourself! This was certainly disorienting - the variety of the culture on show. Even with this scale ther's still time for the smaller moments with creators. There was a lovely signing with Amanda Conner & Jimmy Paliotti, who were very charming and happy to chat about working with Garth Ennnis & Steve Dillon. I can see why calling this a comic con is misleading to some, it's Geek Culture - Cosplay, Anime, Film, TV, K-Pop, Computer Games etc - all in the mix. I love comics but I'm glad to see the wider culture - Rick & Morty, Doctor Who, Nintendo and all. I was only there Sunday when i think it was quieter. I'd go again, and maybe do more homework about what's on. I wish Rebellion were represented. There was certainly plenty to see - everything from Bernard Cribbins to Frank Miller. This was the Batman Dark Knight Panel - Frank Miller, Klaus Janson, Brian Azzarello, John Romita, Andy Kubert Frank Quietly, Jimmy Palmiotti. So in one day (Sunday) I got to see pretty much the DC premier league. It's really a Geek convention but to be fair ComicCon has become the accepted generic name. * I say "stars" but I'm buggered if I'm queuing up to get a selfie with some kid who had three lines in a Harry Potter, or some bloke who was in a rubber suit on Dr Who once. I went to one of the MCM shows in Manchester a few years ago - a much smaller venue than the Excel, but I think they still tried to sell as many tickets as it was horribly overcrowded and queues to get in were huge. I think they have taken this on-board and put effort into putting on a dedicated top drawer Comic Creator experience certainly this year in London. To put it in context I believe the 2000AD 40th bash had 1000 tickets, MCM had over 130,000 in attendance. or you could go to wee Comic Cons and mix with legends! Definitely I'm a fan of cons of all sizes. Love the Lawgivers, early years of BICs, UKCACs, Bristol etc. But I do respect the big ones when they manage to pull off big appearances. And whilst its traditional to bash MCM doesn't mean you should take you hat off to them when they get it right. Are we untouched by this in the UK, or should I be worried about the people (including punters) who attend British conventions? not the same, but UK Cons aren't without their conflagrations! Ahh, my first ever con - I think it spoiled me a bit. 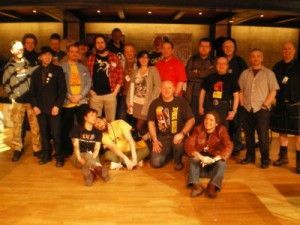 I assumed that after all cons, the punters and creators all go to the pub and for a chinese together (I remember Richmond booking a table for 80 that evening! )!